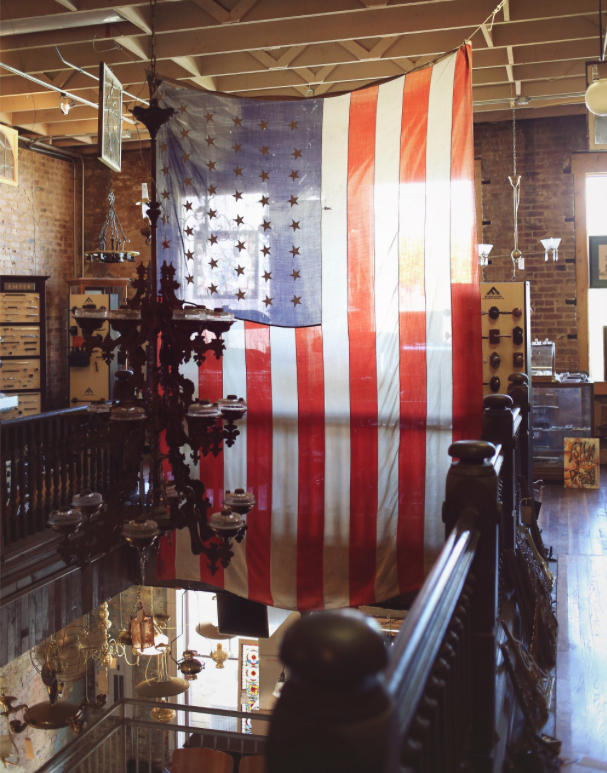 When you visit Southern Accents showroom it will be hard to miss the large American flag that hangs above our staircase. The flag has hung there for the past three years and has become one of the most photographed items in our showroom. It serves as a reminder of the freedoms that we daily enjoy and hold dear. Today is Memorial Day, a day set aside to honor those who have died in active military service. First observed on May 30, 1868, it was then referred to as Decoration Day. A day where the graves of fallen comrades who had died in defense of this great country were decorated with flowers. In 1971 Congress passed the National Holiday Act, which changed the date of observance from May 30th to the last Monday in May. In an effort to help re-educate and remind Americans of the true meaning of Memorial Day, the “National Moment of Remembrance” resolution was passed in December of 2000. This resolution asks all Americans to pause for a moment of silence at 3 p.m. on Memorial Day, as a show of remembrance and respect, for those who have given their lives defending our country. This Memorial Day, as we remember those who have fallen, we would also like to thank and honor those who have served or are actively serving our country in military service. There is no greater sacrifice than the willingness of any man or woman to lay down his life for his country. For those who have made or is currently making this ultimate sacrifice, we say THANK YOU!! 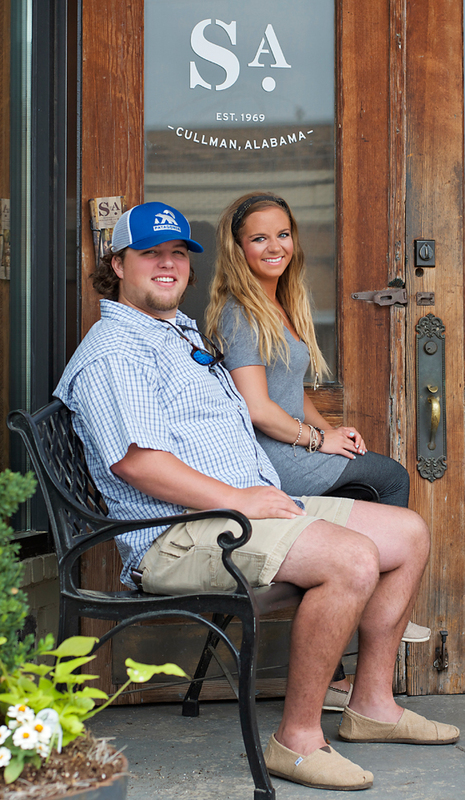 If you have visited Southern Accents showroom in the past few months, you have likely been greeted at the front door by Ben or Makenzie. Hang around the two of them together for very long and you would think they were siblings. Well, they sort of are… Ben is married to Makenzie’s twin sister, Lindzie! Ben joined our sales team this past September. His exuberant personality and contagious smile immediately endeared him to the SA family. Ben, in his spare time, is a passionate duck hunter and a winning little league baseball coach. Stop by Southern Accents showroom and you will likely be greeting by Ben Sellers or Makenzie Maze. Makenzie joined the team this past March after making a last minute decision to move to Cullman to be closer to her twin. Makenzie says, “It was literally an overnight decision to pick up and move. I did not have a job lined up. It was a huge leap of faith, but I just knew this is where I was supposed to be. I called Ben and Lindzie and told them to make room because I was moving in!” Makenzie, who graduated from the University of Alabama with a business management degree, immediately began searching for a job. Around the same time, a position opened up in Southern Accents showroom. Ben approached the owner, Garlan, and told him he had the perfect person to fill the open position. Garlan, having a policy of never hiring family, quickly relaxed his policy after he and his wife Heather met with Makenzie. Garlan and Heather agreed that Makenzie was exactly who they were looking for! Ben and Makenzie will tell you that they are the best of friends. Ben met Makenzie and Lindzie at Wallace State Community College. The three of them were all members of the co-ed cheerleading squad where their friendship developed. Makenzie, at 4’8″ with a background in gymnastics, went on to cheer for the University of Alabama. Makenzie recently moved into her own apartment where she resides with her Maltipoo, Molly. Ben and Lindzie, who are about to celebrate their one year anniversary, share a home with Ben’s three labs Huck, Nahla, and Tate. Ben and Makenzie show off a stunt from their former cheerleading days! 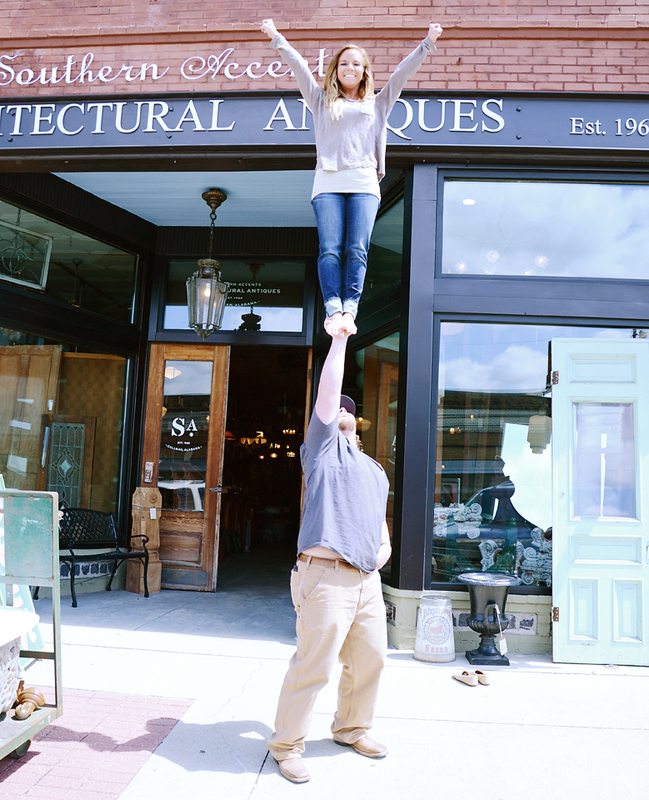 Stop by Southern Accents showroom Tuesday – Saturday and let Ben or Makenzie show you some of our latest finds! Just don’t ask them to demonstrate any stunts from their cheerleading days! 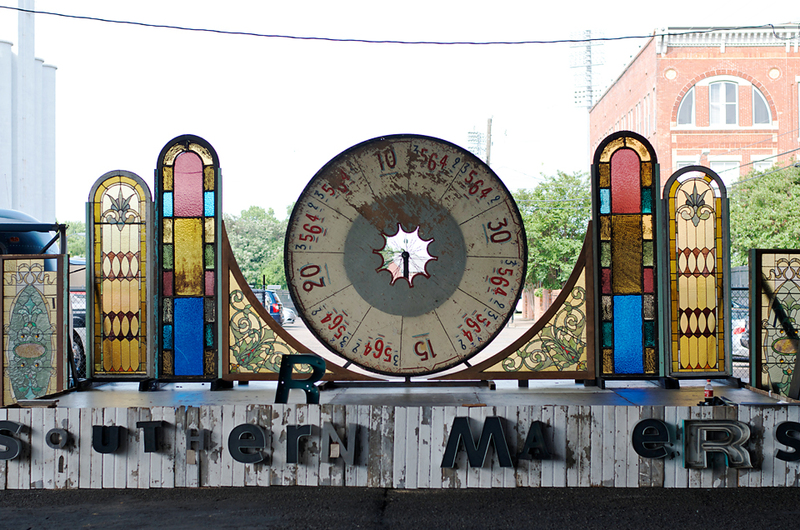 If you follow Southern Accents then you should know all about the BIG event that took place this past Saturday, May 3rd in Montgomery, Alabama… Southern Makers! Planning for the 2014 event started a year ago after the huge success of Southern Makers’s 2013. We stayed busy for several weeks leading up to the event constructing backdrops, staging, and props as well as putting the finishing touches on items for our own booth. 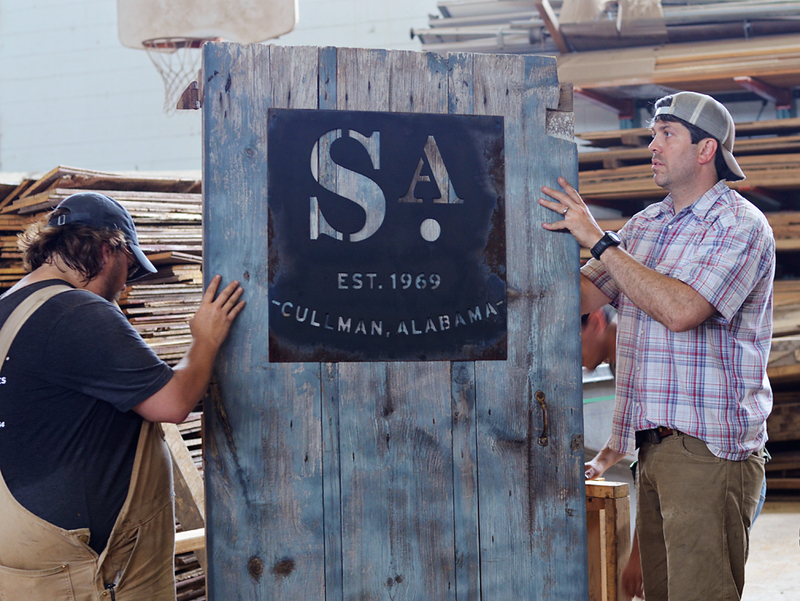 If you have somehow missed the information on Southern Makers, this was an incredible one day event celebrating the creativity and innovation that is Alabama! The event, which was held as a fundraiser for E.A.T. South, was a compilation of some of the most talented artists, craftsmen, chefs, brewers, farmers, designers and musicians from across the state gathered together in one place, for one afternoon. 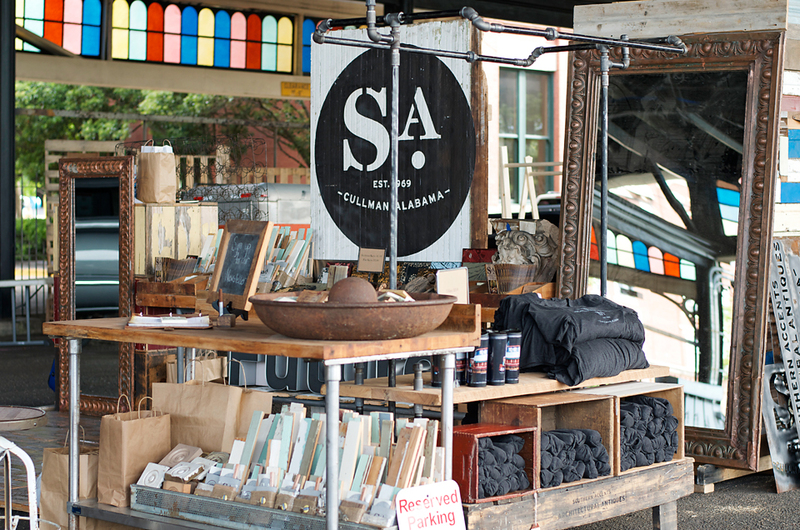 Attendees were able to browse and purchase merchandise from talented artists and craftsmen, enjoy tastes from creative chefs and brewers, sit in on educational conversations with some of the makers and enjoy music from three Alabama based bands. 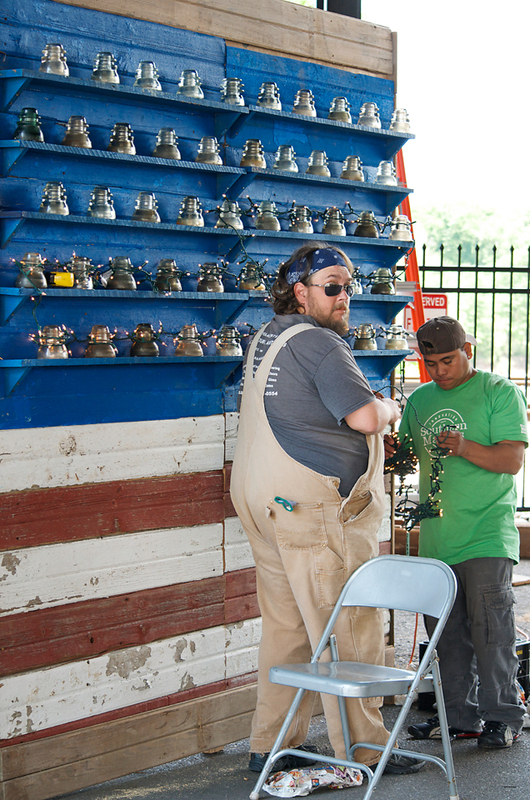 Thanks to our team members countless hours of hard work, Southern Makers 2014 was a huge success! Stay tuned… we’ll be posting more pictures and updates on this fantastic event in the coming days! 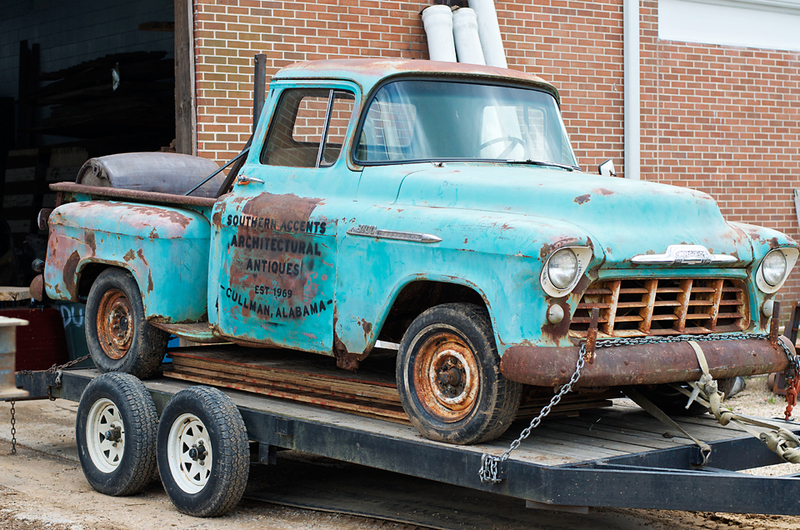 Loading up the 55′ Chevy… almost ready to hit the road! Feeling a little like the Clampetts! A few last minute preparations taking place at the Wood Warehouse. 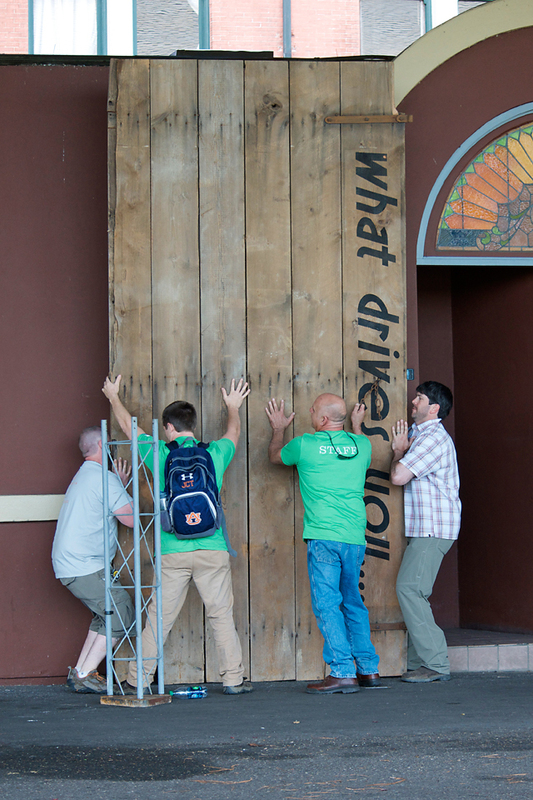 Our team arrived in Montgomery Thursday morning and immediately began work building the stage, dumpster wall, entrance, and SA booth. A HUGE thanks to Cullman Sign and Banner for all their hard work! The SA team members worked tirelessly for two days. 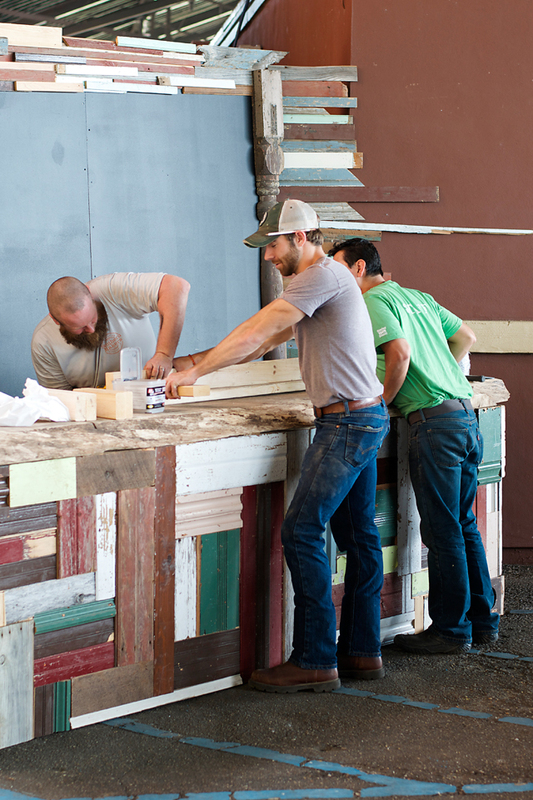 This incredible bar was just one of the many displays that was constructed on site for the event. The Southern Accents booth was set up across from the stage. The stage is almost set!